Was just thinking about making my spring wishlist! Totally on board with the polka dot dress, floral blazer, and black and white bag-- obsessing over the ones Kate Spade has right now! 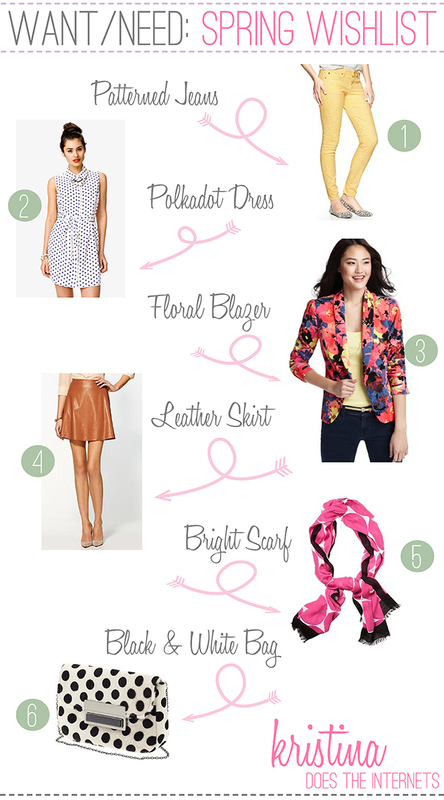 A floral blazer is on my list too - love the one your featured! Yes, yes I do believe that I need one of everything on this list. Perhaps two of that floral blazer. Just because. Great picks! I love that floral blazer from Loft. I've been wanting to add a floral blazer to my wardrobe for awhile and I think spring is the perfect time to take the plunge. Me too! Now I'm just waiting for this one to go on sale, come on Loft!! Me too! I have so many pairs these days but I just keep buying more. Oh gosh I would love a Celine bag, can't wait to see what you get! Most of the patterned/colored jeans I've bought tend to be super spandex-y and less "sturdy" too but I think that's fine, I don't see most of them as things I will be wearing forever. Plus when they wear out it gives me an excuse to buy a new trendy pair! I'm looking to get a nice camera bag too. Yeah I haven't had any luck finding a leather skirt so far, come on stores! I am in love with your spring wish list! I need a floral blazer and a black and white bag! Love this list. I've been buying everything peplum!